These were pretty tough to print, but, a little effort and modification in Blender did the trick! Great job making these! can you post your mods of what you fixed? Hello. I just used regular acrylic paint. I printed them with black PLA so the dark areas deep in the model are already shaded. 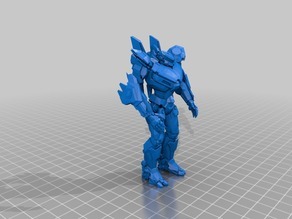 Just wondering if anyone's printed these using Slic3r? The one I printed looked like the supports melded into the model, what a mess! Could you post the modified version so i could print them too? did you have any trouble printing these?